A rarely available three bedroom detached bungalow situated in this sought after village location. 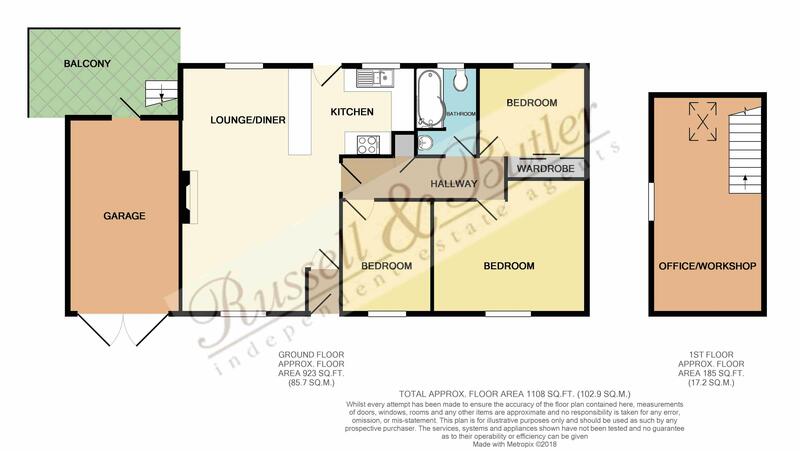 The bungalow benefits from gas to radiator central heating, a fitted kitchen with integrated appliances, double glazing, garage with useful workshop/office over and parking for several cars. The accommodation comprises: Entrance porch, sitting/dining room, kitchen, three bedrooms, bathroom, garage with workshop/office over, gardens and parking. Energy Rating D. NO ONWARD CHAIN. Open plan, ceramic tiled floor. Inset single drainer stainless steel sink unit with mono bloc mixer tap and cupboard under, further range of base and eye level units with work surfaces over, four ring gas hob with extractor hood over, split level electric double oven and grill, integrated fridge and freezer, integrated dish washer, plumbing for automatic washing machine, ceramic tiled floor, Upvc double glazed window to rear aspect, Upvc double glazed door to rear garden. Ceramic tiled floor, airing cupboard with radiator and linen shelves as fitted, access to loft space with ladder, boarding and light, "Worcester" gas fired boiler serving both domestic hot water and radiator central heating. Large free standing walk in wardrobe, double radiator, Upvc double glazed window to front aspect. Built in wardrobe, radiator, Upvc double glazed window to rear aspect. White suite of 'P' shaped bath with shower over and glazed screen, wash hand basin with cupboard under, low flush w.c, full ceramic tiling to three walls, ceramic tiled flooring, ladder towel rail, Upvc double glazed window to rear aspect. On a split level laid to lawn, flower and shrub beds, raised pond with paved surround, covered timber decking with access to rear of garage, stairs to workshop/office, steps to lower level, outside tap, outside power point. Double doors, power and light connected, door to rear, workshop/office over. Velux window to rear, power and light connected. All main services connected. EPC Rating D.